Let’s explore why black, or more specifically, carbon black, is a smart color choice. Carbon Black is a form of nearly pure, elemental carbon. With its different molecular structure from other forms of elemental carbon, graphite and diamond, carbon black has different physical properties. It’s softer than graphite and diamond, and intensely black in color. Carbon black is manufactured by burning hydrocarbon fuels in a reduced heat, controlled manner. Kerosene is the most common hydrocarbon used in manufacturing carbon black. Carbon black has many applications in plastics. It’s used as a pigment, conductive filler material, particulate reinforcement, and UV absorber. 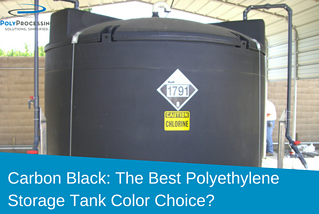 In poly storage tanks, carbon black is used as both a pigment and UV absorber. Carbon black is the standard for UV absorption, when compared to opaque white storage tanks that are pigmented with Titanium Dioxide. Carbon black offers superior weather resistance in storage tanks housed outside. 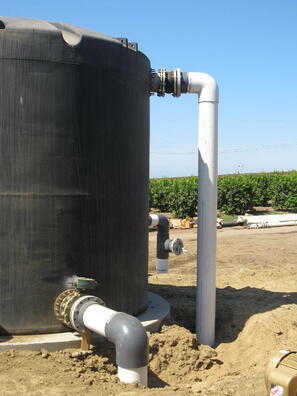 Polyethylene tanks in addition to heating when exposed to sunlight, also degrade from exposure to Ultraviolet rays. UV turns plastic brittle through photodegradation. This degradation results in loss of mechanical properties, discoloration, cracking, fading, and chalking. Photodegradation weathers polyethylene. A simple, inexpensive method to protect polyethylene from UV degradation is adding carbon black as an internal stabilizer material. Carbon black, added as a stabilizer, absorbs or screens out damaging UV rays. The rays are transformed into heat. The heat is harmlessly dissipated throughout the tank itself. The UV index value or rating of carbon black according to an independent study conducted over a 36 month period in the Arizona desert, supports carbon black as a superior UV resistant material. While black tanks have a slightly higher overall temperature than light or white tanks, the UV protection the carbon black provides outweighs the effects of slightly elevated temperature levels. The life of the tank is extended and catastrophic failure reduced due to the potential breakdown of the polyethylene. As a result, carbon black, is the preferred pigment for storing harsh chemicals such as sodium hypochlorite. For more information or questions regarding chemical storage tank color selection, please contact a Poly Processing storage tank specialist.